I was running short on ideas for this Podcast episode so I decided to post on Twitter, Google Plus and my Facebook Page to ask for suggestions. When I read that I thought to myself – AHA, THAT'S IT! A few weeks ago, I got an email from my partner Cassandre Beccai because she had started experiencing just that! She was slaving away creating awesome videos for her audience and within a few hours, she could tell that there were certain people hating on her by giving her videos a bunch of thumbs down. What she wanted to know was How I would recommend dealing with those individuals. This is something I've had to face and as you get YOUR blog out there, it doesn't matter how awesome it is, you WILL start receiving negative comments. In this Episode, I share 10 Tips on How To Handle Trolls, Personal Attacks and Negative comments on your blog. I also answer a Question that was called in by Elby Higginbotham about How to drive traffic to your blog regularly when there are so many things to take into consideration like ALL the different social media sites. 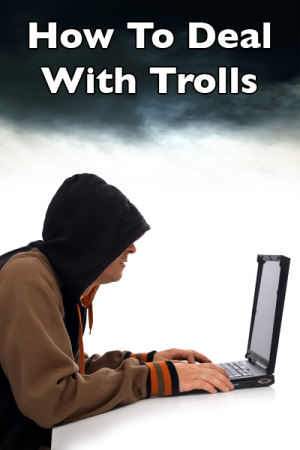 Have you ever had to deal with trolls, personal attacks or negative comments on your blog? If so, how do YOU deal with it? Let me know in the comments below. 099 How I Get Over 50,000 Monthly Visitors To My Blog Using Free Traffic Sources – where I share some useful tips to help build your blog grow an audience and eventually have an impact online. New Case Study – From 0 to 1000 Daily views in 3 months! – where I shared an update on a case study with a good friend, Cassandre Beccai's website. Listening to this ASAP today and have shared it everywhere, thank you so much Leslie and I can’t wait to hear your wisdom, my dear friend!!!! I’m saving this podcast to listen to when I actually get to the point that I get trolls cos I know I will take it personally. Leslie, I can’t believe anyone would call you dumb or the n word. You are one of the smartest bloggers out there. I guess it just shows the trolls’ stupidity. Thanks Cathy. I wouldn’t necessarily call myself one of the smartest bloggers out there, but I appreciate the compliment. This is something every blogger face in his/her blogging business. Awesome Leslie, these tips will make the difference. You are very much welcome Vikas. Glad you found value in it! Great topic and so timely for me. I’ve had to make some decisions about deleting comments recently on my blog. I don’t mind if people disagree with me and have something intelligent to say about it, I do mind when people disagree and act like they know all or they are the best. My biggest complaint is the people who stop by my blog only to leave a useless comment that reads like a 5-year old wrote it and makes no sense. It’s time-consuming to go through and delete these. I love your tip 10 ! I hear you Lisa. It can be a bit annoying. I’ve also found that a lot of those end up actually being spam comments from people who never even read the post. In my opinion, if you don’t think it adds any value, get rid of it. I do that often these days. Yep, tip 10 is the most important in my opinion – Gotta keep on moving and taking action towards your goals. That’s what it’s all about. If you’re on WordPress, a good plugin to help filter out a lot of that garbage is WP-SpamFree. Leslie, I listened to this podcast a few weeks ago, and had to deal with my first trolls this week. Because of your advice, I was able to handle them with grace. Still hurt my feelings, but you are right – they took the time to read my (very long) post. Thank you so much for sharing your wisdom and experience!